Three students were arrested this afternoon while staging a sit-in inside the campus PNC Bank. The students, Ethan Jury, Diane Isser and Daniel Teichman, were taken out the back of the bank in handcuffs by officers, and were transported to the 9th district police station at 21st and Hamilton streets. The sit-in, and the simultaneous protest outside the bank, was orchestrated by the Temple Community Against Mountaintop Removal, which has been fighting against the university’s relationship with PNC. The bank is the number one financier of mountaintop removal coal mining-practicing companies, the activists contend. Campus police only allowed students who were members of PNC to enter the bank to use ATM machines in the front room, and were told the office was closed because of the sit-in. ANGELO FICHERA TTN | Melanie Rafoss stands at the front of a demonstration outside PNC Bank on Main Campus, today. Three protesters were arrested inside the bank. 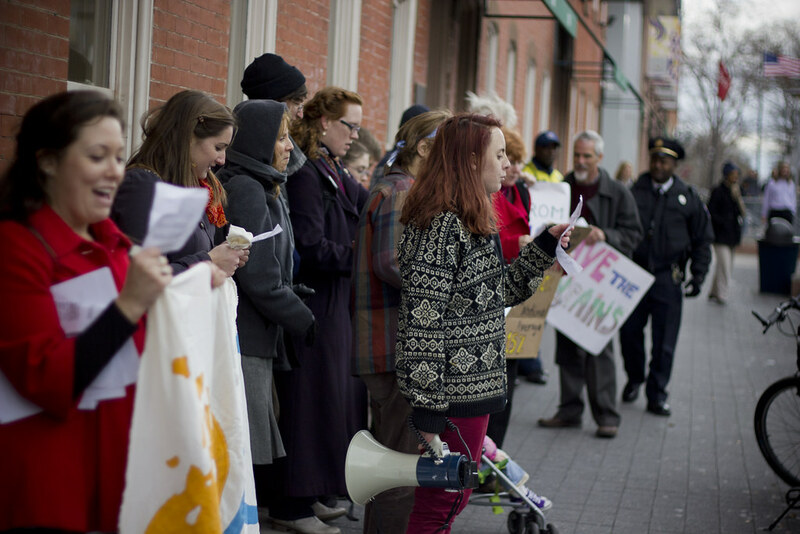 Brianne Murphy, a senior religion and visual anthropology major, and one of the main student voices of the group, was reportedly not in attendance because she was arrested when city police dispersed and evicted Occupy Philadelphia early this morning. Luke Byrnes, a 2009 Temple alumnus, said that Murphy did not intend to be one of the approximately 50 protesters arrested last night. The group organized the demonstration because the Board of Trustees denied its petition to attend today’s Investments Committee meeting and to put the issue of mountaintop removal on their agenda, said Zack Hershman, a member of the Earth Quaker Action Team. The letter, from the board’s secretary, George Moore, stated that the group’s letter and materials that were sent to the board would be presented to the committee at the meeting today. The Board of Trustees’ committees regularly meet in both public and non-public settings. Rafoss said board member J. William Mills III’s involvement with PNC could be hindering their cause. Mills III is the regional president of PNC in Philadelphia and Southern New Jersey. “We’ve asked them for further information about that, but they’ve specifically told us that that’s ‘None of our business,’” Rafoss said. Despite their frustration, Byrnes said TCAMR is still willing to work with the board. However, Byrnes did disclose the group’s plans to develop several student coalitions, which will bolster the effort to wear down the BOT. Byrnes would not comment further on the latter. For more on this and on students’ involvement in the Occupy Philadelphia arrests, check back with temple-news.com. Student group holds a meeting to outline issues of interest that it plans to tackle during the semester. At the Board meeting on Tuesday, trustees approved an additional $5.8 million for the Charles Library and were briefed on the mumps outbreak. The people at that bank are great and treat everyone with respect. I love PNC and they don’t deserve to be harassed like that. I really feel sorry for the 3 students that were mentioned that got arrested because that group is manipulating and brainwashing them. An arrest record is never good. These people leading the protests should be ashamed of what they are doing. The sit in was prefaced with an apology to the workers of PNC. The intention was not to harass the workers, but to raise awareness among the student population of Temple about the undemocratic process practiced by the Board of Trustees. The Board often makes decisions behind closed doors and offers no chance for students to voice their concerns. Temple University is fueled by its students. Without students, it would be nothing. We are demanding our voice. Disrupting business in PNC for an hour is nothing compared to the hell our brothers and sisters of Appalachia live through on a daily basis. Mountaintop Removal has destroyed over 500 mountains and 2000 miles of streams. It has FLATTENED an area the size of Delaware. The people affected have higher rates of cancer, birth defects, and other debilitating diseases. So, I’m sorry if employees had to listen to our demands for an hour, while still on the clock. The 3 brave members of our community that were arrested were not brainwashed or manipulated. They were volunteers. They knew what was at stake, and we are grateful for their actions. All these protests are getting to be a little overboard and misdirected. It would be wise to effect change by going before the EPA or the companies that are performing the construction instead of a college campus bank. Actually, this is precisely how to get heard. Temple students have no direct connection to the bank headquarters. They could easily be dismissed and the issue simply brushed off. Here, the University, which the bank is more likely to listen to, can, ideally, be moved to take some action that the bank will listen to, or at least be aware of. If there are Quakers involved in this (and there most certainly are,) you can bet there is generations, if not centuries of knowledge about effective direct action being deployed. Perhaps it’s time for you to take a course on the history of social change before you make claims about what would be more appropriate?? Thank you for demonstrating My heart is with you. You know what’s funny? You people think that workers are okay with listening to your bullcrap for an hour just because they are on the clock. I work customer service as a cashier, and I wouldn’t appreciate you running your mouths about something I don’t care about while not being a paying customer. I’m not getting paid to sit around and not make money – which is exactly what you do. Go to the businesses who do the mountain top removal stuff. Handcuff yourself to a mountain or something. Don’t disrupt people who are just trying to live their lives. Such insolence; such arrogance. I’m glad you were arrested. Sorry to say, but if you don’t like what Temple is doing, leave the damn school. You are not a part of the Board of Trustees, you have no claim to have your voice heard. Your money is your voice, and if people leave this college and you say “because of your relationship to PNC and mountain top removal” and you do this en masse, they might change their mind. Sorry, but this is liberal bullcrap that doesn’t change anything. The only difference you are making is in your mind. Someone is not being honest with this story it seems. One comment says they were in the bank for an hour but the full video is 13 minutes?? I’m not understanding how 1 hour and 13 minutes of a full video are the same. I’m sure they were given opportunity after opportunity to leave without being arrested like the occupy movement but these students were convinced to take one for the cause. What’s up with the puppetmaster guy in the red jacket and is that what they call peaceful? Something’s fishy. I fully support what these students are doing. They are speaking their mind about a very important issue. They have that right and are exercising it. We are supposed to have freedom of speech. Yes, others may disagree, and they are also free to express their views. Yes, sometimes it inconveniences someone – so be it. People I fundamentally disagree with are free to speak on the FOX TV network – or anywhere else for that matter – and it may give me and many others severe indigestion, but this the way it has to be. All of TCAMR’s demands are listed. Why weren’t you as brave and arrested as well? Are you a coward that lets other peons do your dirty work..? I will be attending Temple in the fall and reading this story gets me really excited! I fully support what these students are doing and I can’t wait to join them next year. Mountaintop removal is a terrible thing. The lengths people go to in order to make money is disgraceful. People are dying and beautiful mountains that were here long before any humans are being FLATTENED. Protests are needed to put a stop to crimes like this.